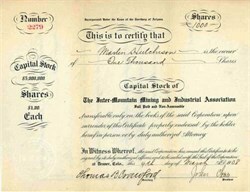 Beautifully engraved certificate from the Inter-Mountain Mining and Industrial Asociation issued in 1908. This item is hand signed by the Company’s President (John Chase) and Secretary (Thomas Crawford) and is over 101 years old. The certificate was made out to Martin Hutchison.